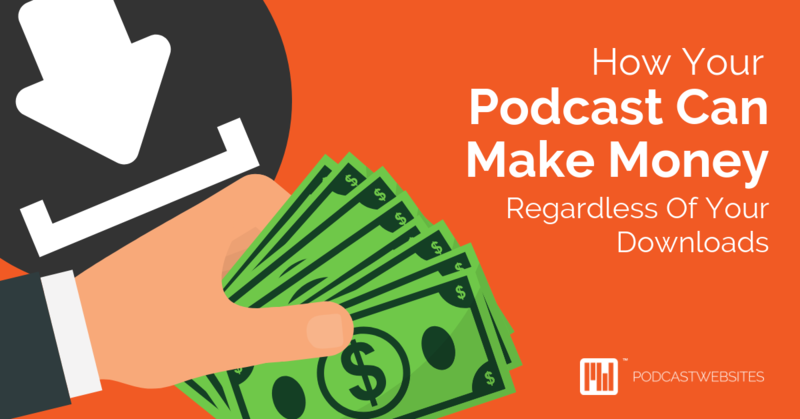 There are so many ways you can monetize your podcast without even THINKING about downloads. Rather than looking externally for podcast sponsorship, the power to monetize is in your hands with the methods below. The key to these methods is to think of yourself differently. You aren’t just a podcaster. You’re an audio influencer. Influencers don’t just talk into a microphone, they engage with the audience, over an entire platform, not just one medium. Once your mind has shifted to a broader definition of what you do, coming up with ways to monetize may feel a bit more open as well. Instead of being paid per advertising campaign, why not try affiliate advertising? Affiliate advertising is where you direct your listeners to a company that you love using a special discount code or link. For every sale the company gets from people who have used your link, you earn a percentage of the sale for yourself. You can run these just like you would a normal ad campaign, where you create audio about the affiliate link, create banners, do a host live read, and put links in your show notes. You can also have a resources page with all the companies that you recommend using your affiliate links. This method creates a win for you and a win for your listener, as you are 100% confident in what you’re supporting, since you chose the companies to partner with! Most affiliate advertisers will pay you out once a month. You do have to disclose on your website that they are affiliate links. There are affiliate networks that can help facilitate this process for you, and they make it nice and easy to get started. Rakuten, Commission Junction and Share A Sale are some great examples of networks. They offer affiliates like Macy’s that pay 10% of whatever purchases are made with your links and ads. If you’re wanting to get into advertising but you’re feeling hesitant, this is a great way to go. You can try out how you feel about ad campaigns without any of the pressure to ‘perform’. One great way to make money with a podcast is by offering content – any kind of content – that your listeners can’t get unless they pay for it. Another way to offer premium content is to limit the amount of shows that you offer for free. Then, if they want anything past that, they have to pay a monthly fee. Trivial Warfare by our good friend Jonathan Oakes is a great example of this. Everyone who supports the show financially by donating to his Patreon link gets a position in the Trivial Warfare Army and a mention on this dedicated page of his website. Perhaps you have one of those audiences or topics that’s really conducive to cool merchandise. You can create t-shirts, tote bags, anything you like with your logo, art, sayings, and sell your merch to your audience. We recommend TeePublic for this service, as they are very podcaster friendly! If you have knowledge about a certain subject, you could sell physical courses, ebooks or webinars like this one, or write a book if you’re an author. Sell these things on your show! You’ll need PayPal or Stripe so you can get paid, and an email service so that when somebody buys something you can email them and say thank you. You don’t need any kind of special stuff on your website, but you do need a payment option and a way to deliver a receipt. There is nothing quite like the feeling of seeing someone you don’t know in a t-shirt with your logo and design on it. It’s amazing! Coaching and consulting are really common ways that podcasters monetize their shows. You could have group coaching, masterminding, monthly packages and VIP days that you offer to listeners. For this method, you almost always need a way to book your time in a digital calendar. Being able to outsource some of the back and forth for scheduling is key. You’ll also want to have auto billing services, in case there’s a monthly group coach or a monthly subscription. Finally, you’ll need to decide on some structure for your offering. How are you going to offer what you’re offering? And what are they going to get? What’s the time? How long is it going to take to like my coaching? Often times, your listener is listening because of the information and advice you love to give. They are almost always willing to go deeper with you, and pay you for your time. It is very possible to turn your podcasting experience into a speaking career. Tons of people have done it successfully. To start, book gigs to speak starting out for free. Offer to teach on webinars. Join Toastmasters. Get really good, comfortable, and articulate. As a career, you can be booked to speak to corporate leaders, do digital training, emcee, judge contests…speaking is really a flexible and fun way to make money. To get started, you’ll need a one sheet that talks about you who you are and what kind of talk you do for wide audiences. It may also include the kind of topics you speak on, some demo videos and some interviews – either on other podcasts or guest appearances on other shows. There are so many creative ways to have a membership site – and sometimes this can actually coincide with the monthly group coaching from above. A membership site can also include an exclusive deal, similar to a Costco, but online. For x amount of dollars a month, you give them an exclusive discount or deal, or access to select products. Membership can also include access to premium content. It can also be first dibs at events or products. You can give them discounts on the stuff you offer everywhere else. That’s what’s great about having a membership site – people do pay for exclusive access to you. There is a great resource by Mike Morrison from The Membership Guys in The Podcast Success Academy. If this strategy appeals to you, go check it out! Live events are so much fun! This method of monetizing is a great way to get to know your audience in a whole different way. Special trainings, retreats, cruises, meetups – any time you’re spending your ‘in person’ time to meet your audience can be a paid event. You can also charge to perform the podcast for an audience. Lou Mongello hosts WDW Radio – Walt Disney World radio. Lou used to be a lawyer in New Jersey, and he just loved Disney World, it was/is his favorite place. Now, he has paid meetups in Disney world, and he tours people around the park and they pay him for his time. That is his career now – arranging live events and meetups for his listeners. Monetizing this way can be as easy as putting a PayPal button on the website tell people to support the show. You can ask for donations at the beginning or the end of your podcast, and it doesn’t have to be a whole charity drive. “If you like the show, don’t forget shepodcast.com/patreon”. If you have a loyal fan base, this method can really work. Some podcasters make 5 figures a month, and auction off content decisions, merchandise, all kinds of things via Patreon. Now that we’ve gotten your wheels turning, how are you going to make your podcast successful?